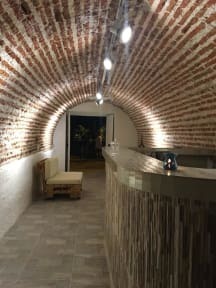 El Arsenal Hostel Boutique kohteessa Cartagena, Colombia: Varaa nyt! Very clean and nice hostel overall. The decoration is cool and quite modern. The pool and bar areas are nice and the atmosphere was very friendly. I’d definitely stay here again! I would recommend this hostel! We had a wonderful stay at El Arsenal. The hostel is very clean and the house os beautiful. The location is very good and the pool made the waiting for check-in very enjoyable. The beds had crumply plastic sheets under the normal sheets but that is the only thing to complain about.